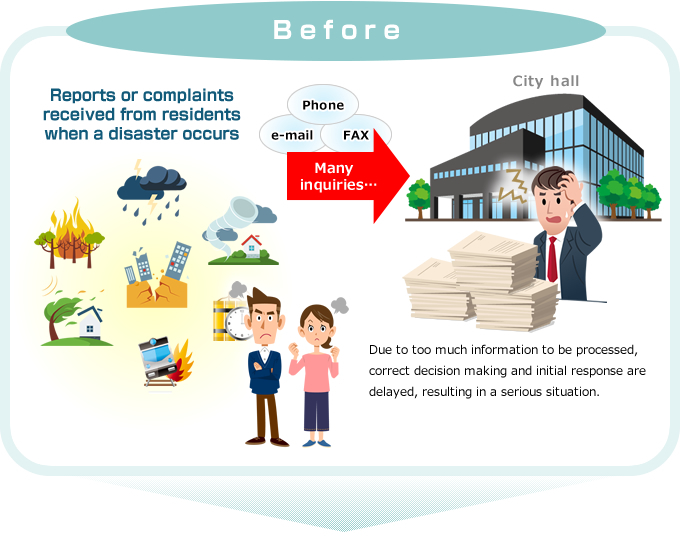 When a disaster occurs, municipal staff promptly collect and confirm the damage situation, and then deliver/distribute the collected information to the residents at an appropriate timing. 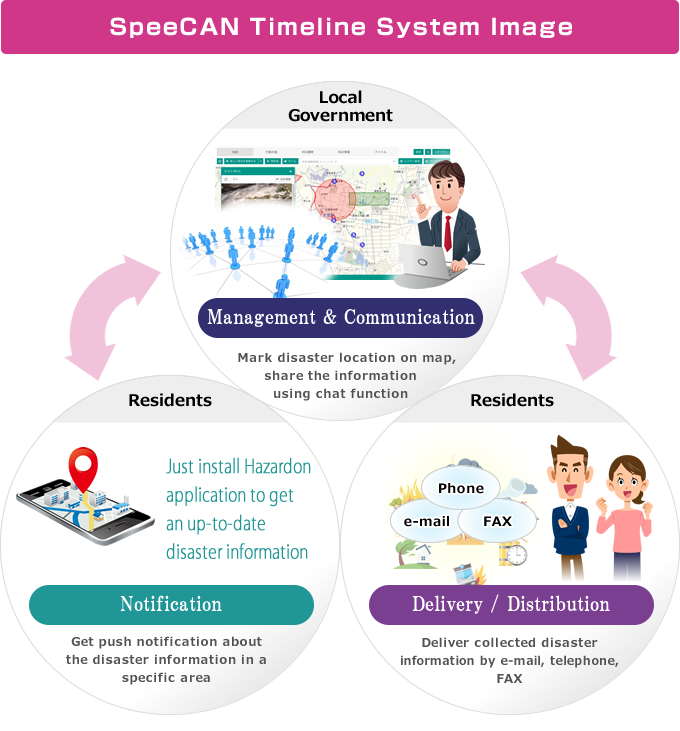 Disaster prevention SNS “SpeeCAN Timeline” is a disaster prevention/mitigation solution specialized to deal with such situation. Collected information is plot on the map, to clearly and visually manage the point/location related information. Easily register disaster spots by GPS position information of smartphone. Upload photos and videos associated with the point information. Disaster location plot on the map can be shared by chatting function. It is possible to create chat rooms such as Disaster Countermeasures Headquarters in advance with some designated members. Chat content as time series information, can be output as a CSV file, which make it convenient for creating a report. When the river floods, information about the flooded area or road blockade situation can be sent from the map. 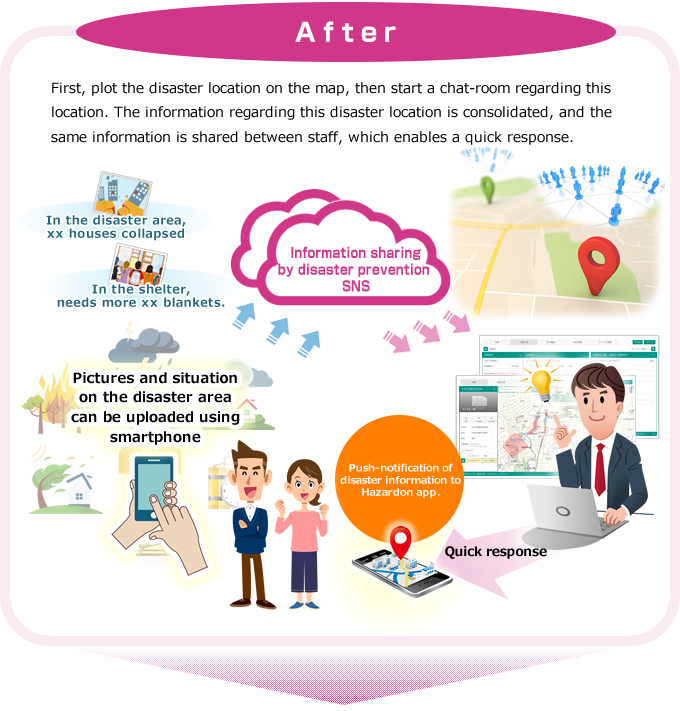 In addition, information about the opening/closing of an evacuation site, temporary evacuation shelter can be displayed on the map easily. Easily manage photos, videos and documents related to each spot on the map. Organizing documents such as Word, Excel, PDF in association with each event on the map, is not only helpful for disaster response, but also for daily work. Moreover, since the stored files can be previewed on the browser, the influence of security cloud will be much reduced. * Fee will vary depending on the number of users, the capacity of the hard disk, etc. * Specifications, display, etc., are subject to change without notice.